Even some of the best personal injury attorneys can have trouble handling a case involving a commercial vehicle or large truck. Finding the right personal injury attorney – one with over two decades of experience representing semi-truck accident victims – can make all the difference in your case, as there are many potential roadblocks for an inexperienced attorney. Semi-truck accidents routinely cause catastrophic damage. Check your local news throughout the week and you’re likely to see several of these accidents in your area, resulting in serious injuries or loss of life in many cases. The victims in these cases face a long road to recovery, and their choice of attorney could be one of the biggest decisions of their life. While the legal implications of that choice is obvious, few are aware of how a small mistake by their attorney can derail their entire case. Attorney Chris Davis of the Seattle-based Davis Law Group, P.S., has over 20 years of experience representing semi-truck accident victims. Mr. Davis knows the ins-and-outs of these cases, the deceitful tactics used by trucking companies and their team of defense lawyers and how patience can be the best strategy. Lawsuits against trucking companies are complex and can take years to settle, and achieving the best possible result for the client often means outwaiting the other side. The trucking company wants you to take a quick settlement – do not fall for that trick. 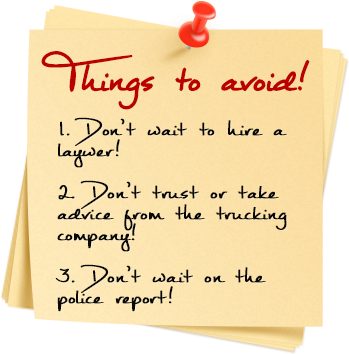 Below you’ll find eight common mistakes that an inexperienced trucking accident attorney will make, any one of which could ruin your case. First and foremost, the injuries and other damages that result from a semi-truck collision are naturally more likely to be significant and life-altering, especially if the collision involves a large semi-truck and a smaller passenger vehicle. Not surprisingly, the damages and harms resulting from a semi-truck collision are usually much higher. This can result in much higher medical bills, larger amounts of lost income, and a greater need for compensation to cover past and future losses that are likely to be incurred. With higher damages at stake, it is much more likely that victims will have to hire an experienced attorney and/or litigate the claim. The average general practice attorney is going to have a very limited understanding of the laws and responsibilities that relate to trucking companies and their drivers. And while there is a chance a less experienced attorney may understand some of the basics of handling motor vehicle accident claims, the chances that the attorney will understand all of the federal and state regulations involved in a trucking accident case are low. This increases the importance to the injured victim of not only hiring an attorney, but choosing the right attorney for the victim’s case. Any number of factors could cause a semi-truck accident, but the right trucking accident attorney will do thorough research and investigate the trucking company for negligence on their part which may have contributed to the collision. Simply looking at the driver’s errors and not placing any blame on the company that employees that person will drastically impact what damages can be won. A trucking company is responsible for what its drivers do behind the wheel, and the right attorney knows that. When a motor vehicle accident occurs involving one or more passenger vehicles, the insurance companies who insure the drivers will usually investigate the collision at some point. However, many times the investigation will have a lower priority, and will not commence for several days or even weeks or months. But when a commercial vehicle is involved in a collision, time is of the essence. Attorneys who represent victims in these cases must realize how important it is to begin right away. It is not uncommon for the trucking company’s lawyer and experts to arrive on scene soon after the collision has occurred. To combat these aggressive tactics, the right trucking accident lawyer should be equally as prepared and ready to begin the case. While everyone behind the wheel – whether it’s a passenger vehicle or a commercial truck – should be safe, attentive and educated, trucking companies must abide by a different set of rules and regulations. The right trucking attorney will know the federal and state laws for trucking, the hiring process these companies go through, maintenance requirements for trucks, as well as the drug testing process. Law enforcement is likely to obtain a truck’s “Blackbox” – a device that monitors critical information about a truck’s performance – before either legal team does. It’s important that your attorney gets this information and knows what to look for, as it can lead to key discoveries in the case. Obtaining the Blackbox can be complex, and trucking companies might attempt to deny you. 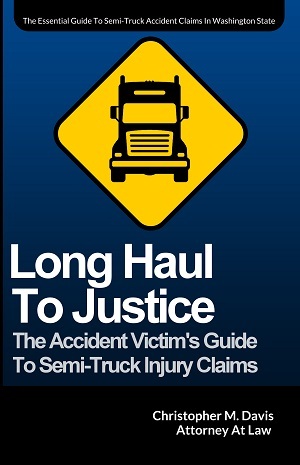 An experienced trucking attorney may have to do some legwork to get this information. No longer can trucking companies make the distinction between an “independent contractor” and an “employee.” Federal regulations now state that a trucking company’s fate is intertwined with its driver, no matter the label. Over the years, our office has been contacted by trucking accident victims looking for a second opinion about their case after another attorney declined them because the trucking company claimed the driver was an independent contractor. We have a step-by-step process for investigating these claims and determining whether or not the trucking company is telling the truth. Often times, we have been able to prove that the driver was a full-time employee of the trucking company and that the company is therefore liable for our client's damages. When investigating trucking accidents, it is often critical to contact and retain appropriate experts to help with the case. Sometimes there will be few qualified experts in a field, so it’s important to contact or hire the expert first before the trucking company and its lawyers do. Having the best expert in a critical field that is relevant to the case can also substantially increase the chances of a much more favorable outcome in the case. There are two likely reasons that an inexperienced attorney may fail to hire the right experts for a trucking accident case: either due to a lack of experience and understanding of what it takes to successfully resolve a trucking accident case, or because experts are expensive and the attorney does not have the financial resources to hire the experts. Regardless of the reason, not hiring the right experts for a trucking accident case significantly affects the chances of a successful outcome. A significant problem with the trucking industry is that companies’ safety and compliance departments are often only focused on maintaining compliance with federal regulations, rather than actively focusing on preventing accidents that result in injuries and fatalities. Simply complying with federal regulations only helps the trucking company avoid fines and penalties from the federal government, and does not automatically result in a safer and less dangerous environment. The right trucking attorney will look at all angles of the crash and determine the right legal strategy to maximize the settlement. And ultimately, an attorney handling a serious trucking accident case should always be willing to take the case to trial if necessary. If you or a loved one has been seriously injured in an accident involving a semi-truck, 18-wheeler, big-rig, or other commercial trucking vehicle in Washington State, contact Mr. Davis and the team at Davis Law Group at (206) 727-4000, use the chat feature below or fill out the contact form on this page to schedule your free legal consultation.